Happy World Wetlands Day 2018! This year’s theme: “Urban wetlands make cities liveable” is all about urban wetlands and their role for a sustainable future. It reminds us that our wetlands are valuable and that we should work to retain, restore and manage wetlands, integrating them into development for a more sustainable future. Wetlands provide a variety of ecosystem services including: acting as carbon sinks, a nursery for marine life and a habitat for bird and terrestrial life. Wetlands also assist with maintaining coastal water clarity, help regulate nutrient input to our marine environment and provide coastal protection. Coastal mangrove forests act as buffers protecting our communities from storm surge whilst our inland wetlands help to reduce flooding by acting as a drainage basin soaking up and storing stormwater. 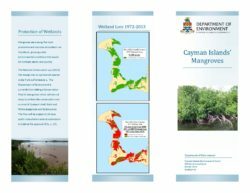 This world wetland day we invite you to learn more about Cayman’s wetlands and their value by downloading our Cayman Islands’ Mangroves leaflet below. To learn even more about wetlands and this year’s theme visit www.worldwetlandsday.org.